So, if you want to take the best low-light photos with the OnePlus 3T, make sure it is in “HQ” mode and for Pixel/Pixel XL, make sure to use “HDR ON” mode (not “HDR+ Auto” as it will revert to normal mode in low-light). Now, these quirks shouldn’t have to be manual settings for each of these smartphones but to make the most use out of them, knowing this will come in handy next time you take a photo in low-light. As for OnePlus 3T’s noise reduction, this is a software processing done on camera which is actually very useful for those of us regular Joes who are not professional photographers and don’t know how to use Photoshop. It is definitely a cool feature to have on a smartphone and OnePlus 3T is one of the first smartphones to have it. With that said, you can also take photos in RAW mode with OnePlus 3T(which is another cool feature) then reduce your noise yourself using Photoshop or Lightroom, further being able to control your photos than the Pixel. Overall, Pixel is an overall better camera than OnePlus 3T but with HQ mode, you can take much better photos with the 3T than many other smartphones. Next story LeEco LePro 3 Unboxing! 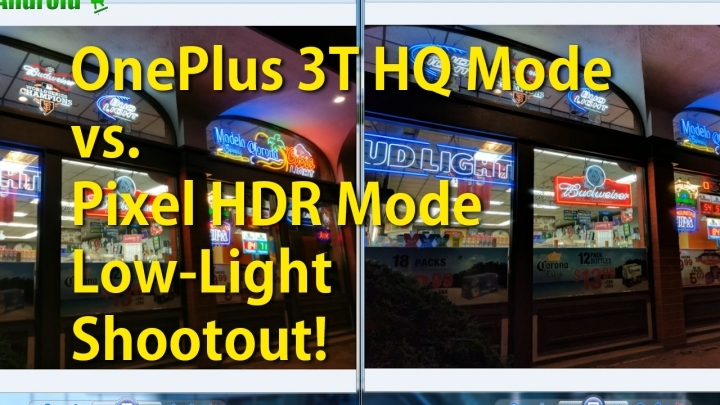 Previous story OnePlus 3T vs. Pixel Camera Low-Light Comparison!